ARISTON BTS has completed the new facilities that are now used by ORT. The system is entirely based on VSN solutions. Ingest servers (2 Capturers), MAM (Sharer), news room automation and news playout server (Airnews 1ch), transmission server (Matic) legal recording (LegalRec). VSN matic controls continuity’s CG (vsn cg), the system router (Evertz Xenon) and the master control switcher (Evertz QMC). The 6 editing stations are using ADOBE PREMIERE and are capable of sending material to both the news and the continuity servers. 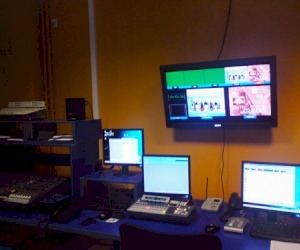 Interfaces are by CRYSTAL VISION while the main baseband equipment is from EVERTZ (SPG, Router, MCS, Multiviewer). 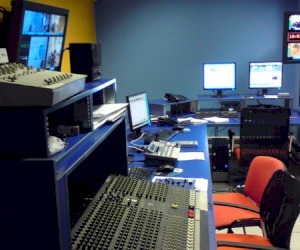 In the control room, SONY DFS800 is used and the studio cameras are SONY DXC-D55. Microwave links by GTBroadcasting. Old equipment has been retained in the new installation (backup server, PAL multiviewer, PAL interfaces, audio switchers, telephone hybrids etc), which demonstrates ARISTON BTS’s flexibility in such installations.